His only crime was being a member of the Communist Party. 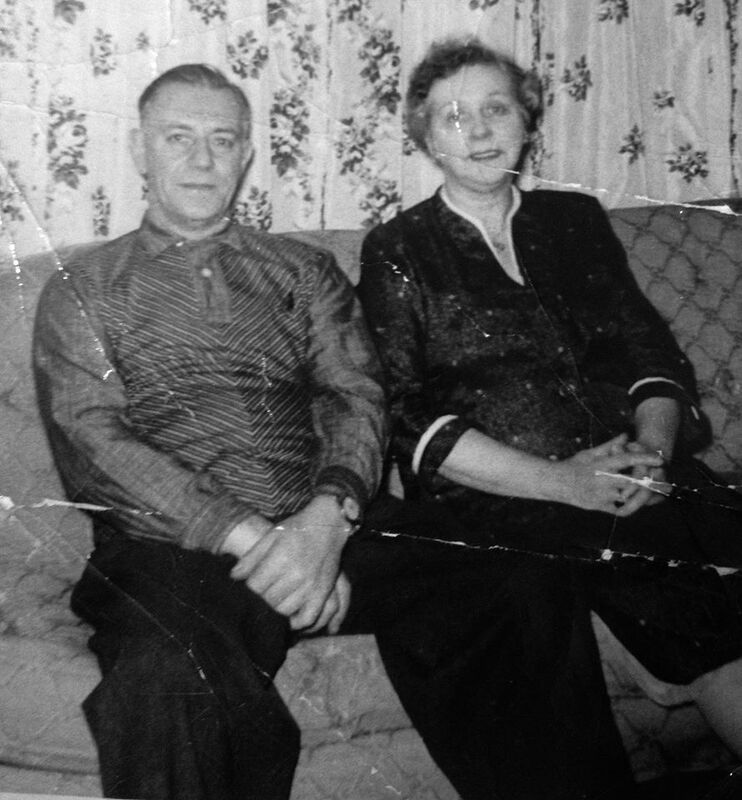 Charlie Doyle’s story is one that I learned not from McCarthy-era newspaper articles, but from sitting in kitchens and on front porches on Seneca Street in South Buffalo. You’d expect that kind of talk from his family — from my family. Charlie Doyle was my grandmother’s uncle. 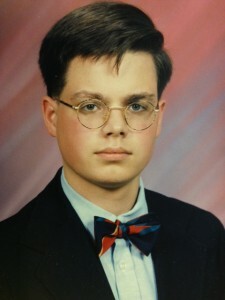 Aunt Agnes’ brother. I grew up in the ’80s, not the ’50s, but Communists still weren’t good. 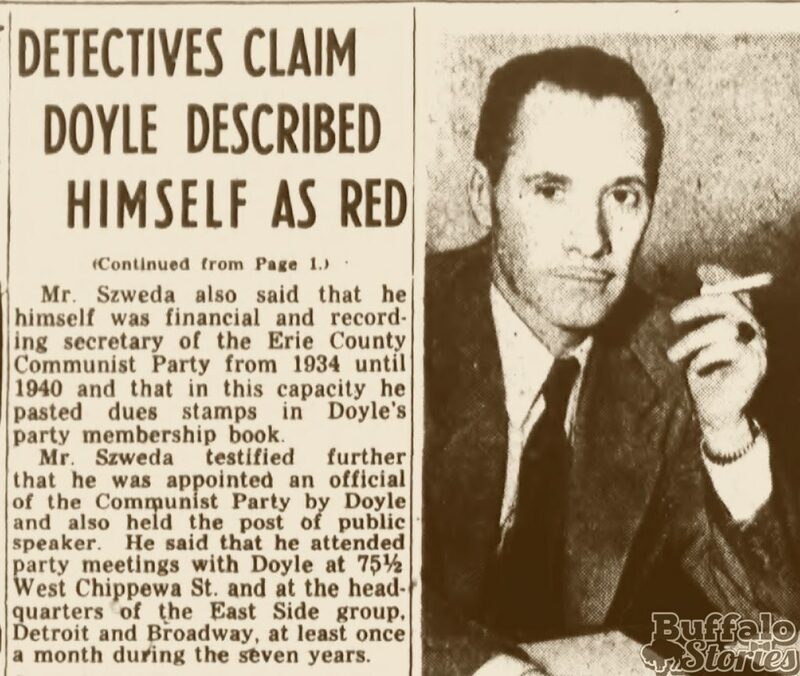 They were the bad guys, but there was still Doyle, the Communist who caused people to smile when they talked about him. I didn’t realize until later that the story of Doyle was a bigger deal than just family lore. Though he continually denied it publicly for his safety and the safety of his family, he was a member of the Communist party. 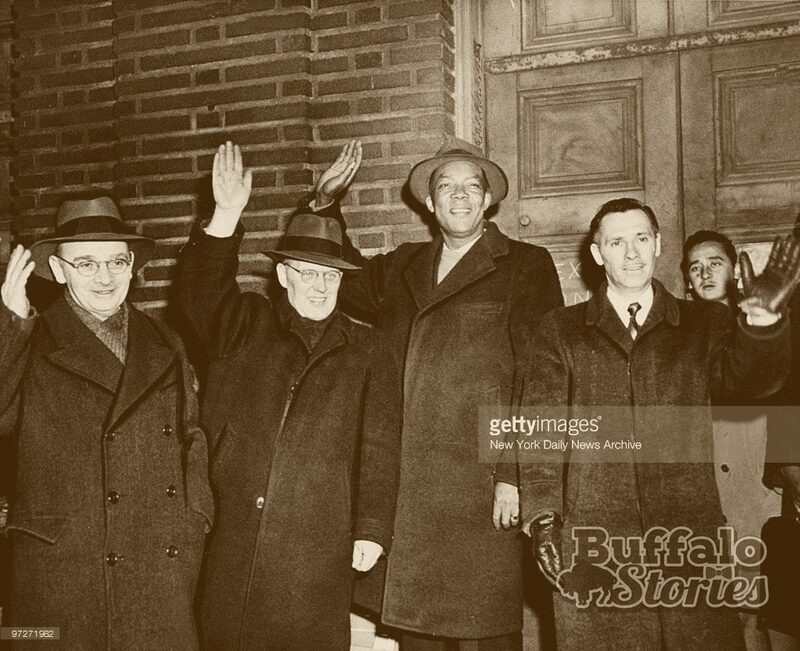 He was also a talented labor organizer and helped workers force safer working conditions and better pay at places such as Bethlehem Steel, Republic Steel and Carborundum. 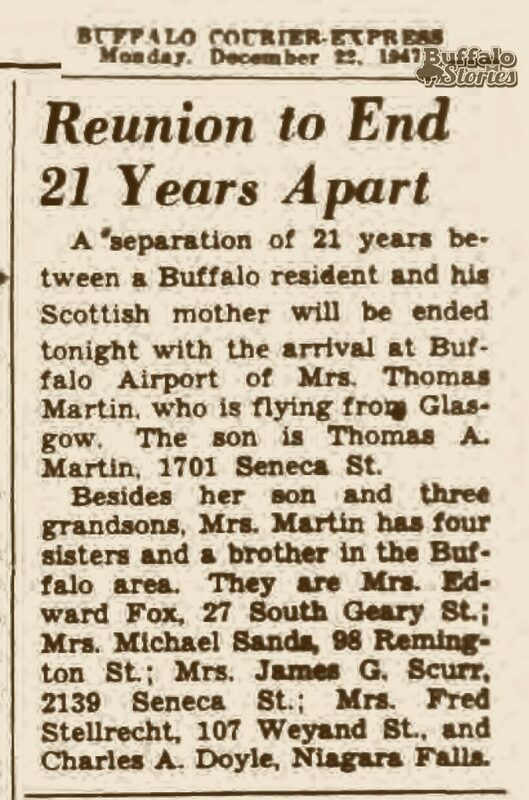 Despite having been a legal U.S. resident for 25 years with an American wife and family, because he was born in Scotland, he wasn’t allowed to re-enter the U.S. after a trip to Canada in 1949. He spent the next several years in and out of prison based on illegal entry charges before– at the height of the McCarthy era– he was deported in 1953. Communists Gerhard Eisler, John Williamson, Ferdinand C. Smith and Charles A. Doyle wave to crowd as they step on ferry on Ellis Island– where they’d spent months imprisoned. 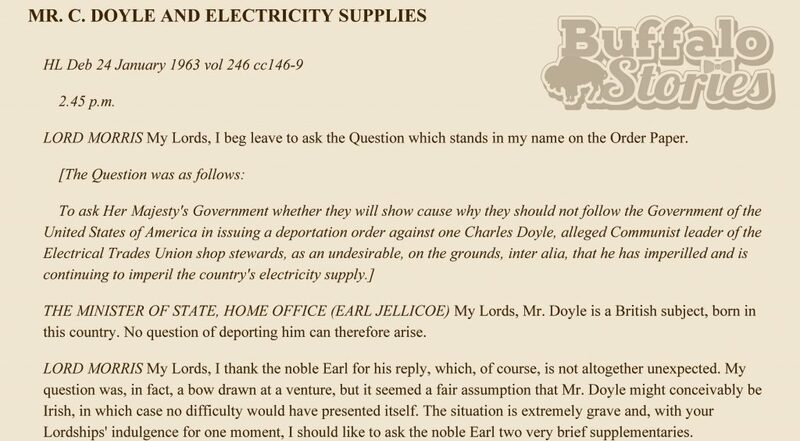 Being deported from the US wasn’t the end of Charles Doyle’s trouble. 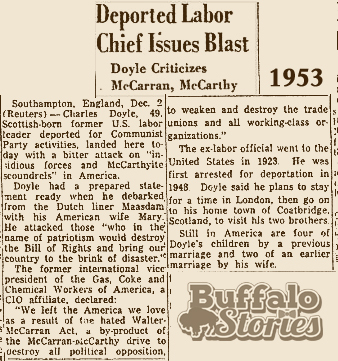 In London, Doyle picked up where he left off in Western New York– leading labor organization efforts at a nearby power plant. The resulting nationwide labor slowdowns caused massive power outages, including at London’s famously lit Piccadilly Circus. Those outages came during one of the coldest snaps of weather on record in London, and nearly two dozen people died from the cold. 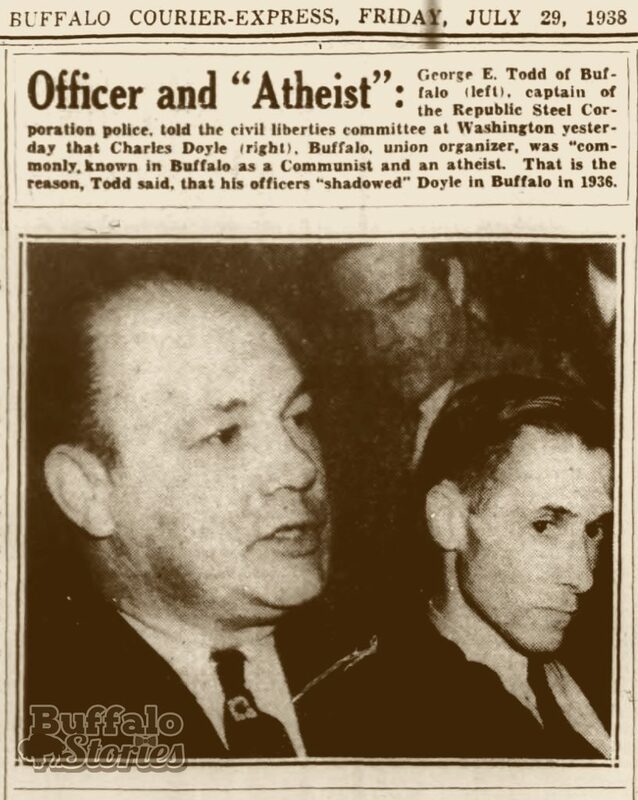 Doyle was tried in their deaths but exonerated. And it wasn’t just America that didn’t want him. 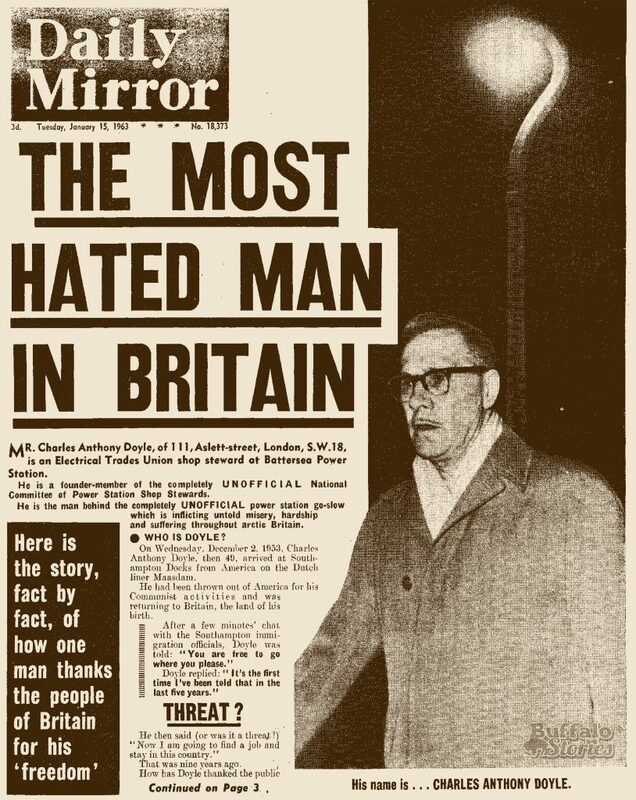 Despite having being deported from the US to his native UK, the House of Lords discussed trying to send him back. When (John L.) Lewis broke with the American Federation of Labor and sponsored the Congress of Industrial Organizations to organize production workers, he said that he hired the communists to organize the workers because communists were the best organizers, idealists sacrificing everything to get workers organized — and when they got the workers organized, he fired them. 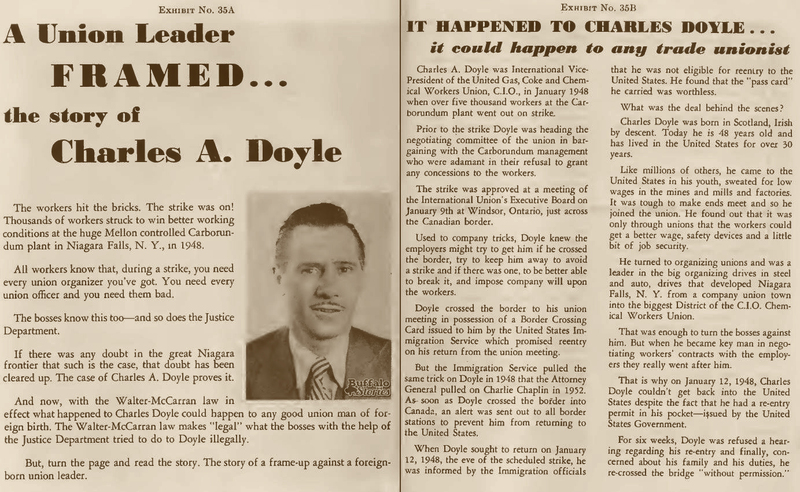 When Lewis subsequently split with CIO leaders and formed District 50 of his Mine Workers Union to organize chemical workers in Niagara Falls, he again hired Charlie Doyle. When Charlie finished organizing those chemical workers into the union, Lewis again fired Charlie. Workers Union hired Charlie — and all those same unions of chemical plant workers switched over to the AFL-CIO with Charlie. Carborundum workers went out on strike in connection with contract negotiations and leaders of the union in Washington held a meeting about the strike across the river in Fort Erie, Canada. U.S. Customs and Immigration wouldn’t let Charlie back across the bridge into U.S. But Canadian authorities looked the other way while Charlie crossed the river back into U.S. in a boat. finally agreed to be deported to England in return for U.S. government authorities persuading his Catholic wife to agree to end their marriage so he could marry the woman he loved. Doyle died in London in 1983. His obituary appeared in the Chicago Tribune. Torn-Down Tuesday: Is Buffalo home of the ice cream sundae? One fact is not in doubt — Buffalo’s first ice cream soda fountain was opened at the Stoddart Bros. Drug Store at 84 Seneca St., and the Stoddart brothers built what was said to be the country’s largest drug store based on sales at the ice cream counter. 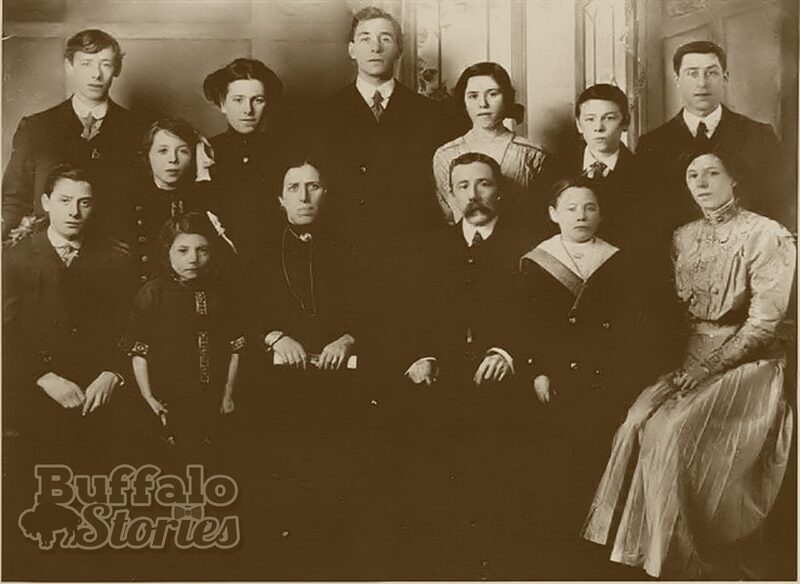 But seemingly forgotten in the annals of Buffalo myth and lore was the claim made by members of the Stoddart family through the years that the first ice cream sundae was served at the Stoddart Bros. store on Seneca near Ellicott, on a spot that is now somewhere between second base and center field at Coca-Cola Field. So along with the chicken wing, should Buffalo be claiming the ice cream sundae? While no definitive proof exists, the long-dormant Buffalo claim seems at least as strong as several of the other cities that have staked their civic pride on ice cream, fruit sauce, whipped cream and a cherry on top. The Stoddart brothers, Charles and Thomas, were born in Scotland and spent time in Canada before landing in Buffalo. 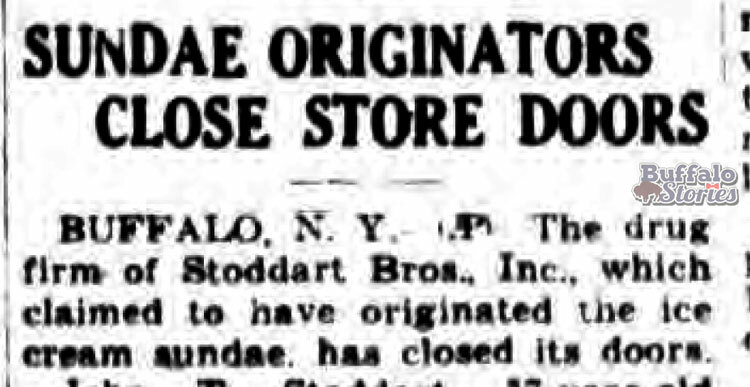 They worked in another Buffalo drug store for four years before opening their own Stoddart Bros. store in 1876. Charles Stoddart, the younger brother, had his hand firmly on the helm of the business, working most days late into the evening. Thomas Stoddart was a more familiar figure in Buffalo business and civic life, and he served as a city councilman as well as several terms as the president of the New York State Pharmaceutical Association. After 24 years wildly successful years at 84 Seneca — including having opened Buffalo’s first soda fountain — the brothers expanded in 1900, buying the buildings next door at 86 and 88 Seneca St. They invested $20,000 in building updates designed by Louise Bethune, the Buffalo woman who was also America’s first female architect. The new store boasted 50,000 square feet of space over four floors, and 60 people worked the 1,000 feet of showcases on those floors. Written up as “America’s largest drug store” in several national trade publications, the new store featured a $5,000 soda bar as its crown jewel. The American Soda Fountain Co. piece had seating for 75 with as many as 12 fountains running at any given time, serving the 250 stools that filled along the counter space of a large part of the main shop floor. 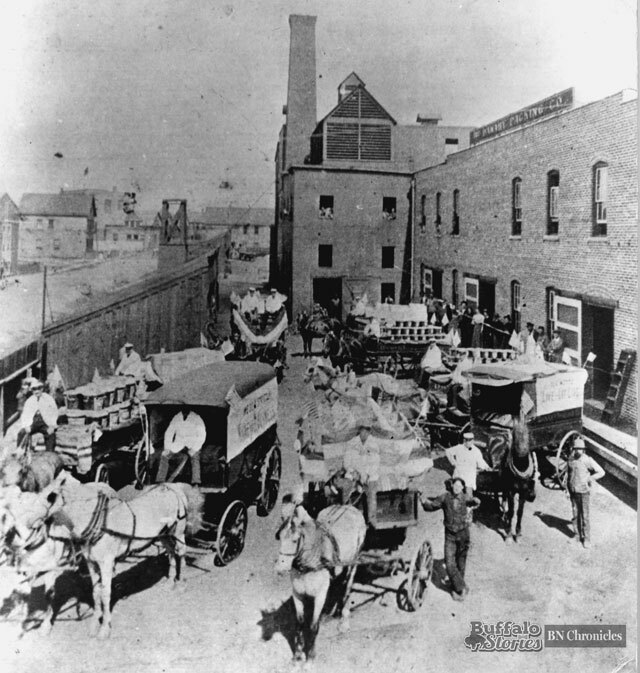 The new facility also allowed Stoddart Bros. to make its own ice cream in a special plant in the basement. Up to 100 gallons could have been on hand at any given time. The building also had facilities for the manufacture of perfumes as well as medical appliances and prosthetics. Around 1903, Stoddart Bros. was doing a daily soda business of $200 — not bad, considering most sodas were a nickel. More than just a sweet treat, many believed in the health benefits of ice cream sodas — especially during the heat of the summer. Stoddart’s was Buffalo’s most popular place to escape from the heat — cooling fans and a drink of cold ice cream and soda water was about as cool as anyone could expect. The original three-storefront Stoddart Bros. building burned in a spectacular blaze in 1919. Flames of every color shot from the laboratory where prescriptions were crafted. The store reopened almost immediately down the street, but it never fully recovered its place as America’s largest drug store. Through the 1920s and 1930s, Stoddart Bros. had several stores throughout the city, but when Thomas Stoddart’s son decided to retire in 1946, the 70-year-old family business closed permanently. The news of the closure made headlines around the country after The News published a front-page story with a claim from John Stoddart that his uncle Charles was the creator of the ice cream sundae. “About 50 years ago, the store ran out of soda water one Sunday morning and my uncle, Charles Stoddart, suggested that the clerk serve two scoops of ice cream with syrup on top. It was hurriedly named a ‘sundae’ and immediately (was) very popular,” said John Stoddart in 1946. The Gloversville Morning Herald was one of many newspapers around the country to carry the story with Buffalo’s claim as the home of the ice cream sundae. Twenty-five years later, United Press International distributed a story that went into greater detail with the founder’s son, then 84. He said the gas to make the soda ran out on a hot Sunday at the busy counter. “They called my uncle and he told the clerk to give them scoops of ice cream and syrup, or strawberry preserves, without the soda,” Stoddart said. There are a handful of problems with Stoddart’s story. First, most of the claims of “the first sundae” date to the 1880s or early 1890s. 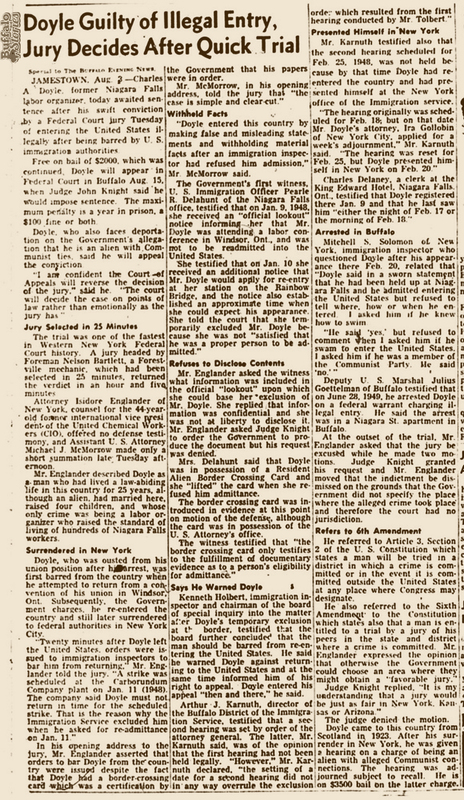 So any claim would have to be earlier than “the turn of the century.” There were also at least two big players in soda bar supplies in Rochester: Alick G. Richardson’s Richardson Corp. and J. Hungerford Smith, which was the exclusive Orangeade seller at the Pan-American Exposition. An extensive search came up with plenty of ads for both businesses’ soda bar and sundae supplies, but nothing about Stoddart Bros. That’s not to say one doesn’t exist, but it didn’t come up in hundreds of reviewed ads. Stoddart Bros. did regular, nearly daily advertising through the 1880s and 1890s, and the wholesomeness of their “fresh Holstein cream” ice cream, cleanliness and cooling fans are usually made the biggest selling points — without mention of sundaes by name. The company also received quite a bit of publicity as “America’s largest drug store.” The Buffalo claim to the sundae was never made in any of those national news stories. 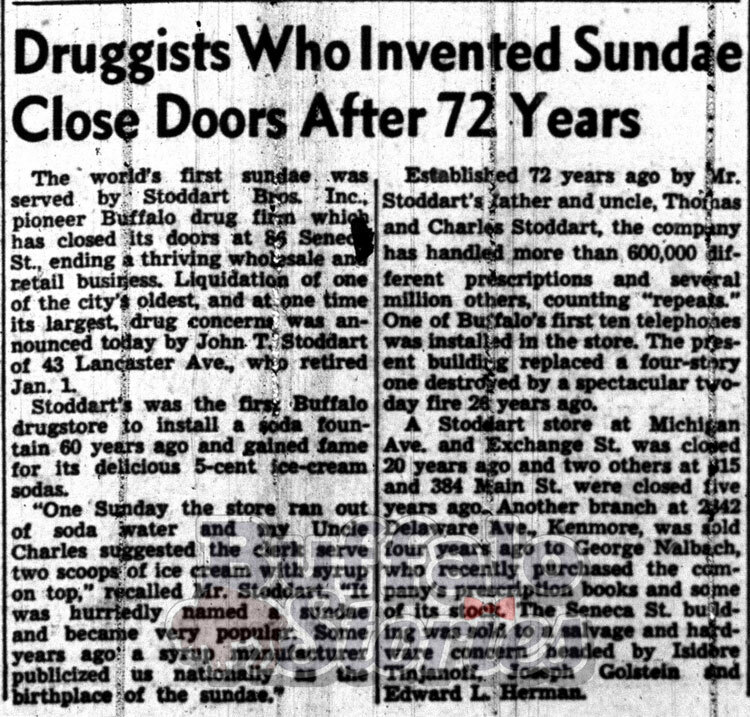 The first time any mention of the Stoddart sundae story can be found in Buffalo papers is the 1946 Buffalo Evening News article announcing the store’s closure, more than half a century after the event would have happened. This combined with the weak “naming of the sundae” story leaves a bit of a melted drippy mess — but other sundae stories have low melting points as well. In gathering up the stories of “the birth of the ice cream sundae,” it might be that no single location can say they first served the exact treat we’d order at a Dairy Queen today. But clearly, several different places — Buffalo included — can lay claim to different parts of the evolution of the modern ice cream sundae. Two Rivers, Wisc., is the home of Edward Berners; legend says he was the first to drizzle chocolate syrup over ice cream in 1881 (or 1899, depending on which account you believe.). According to the Wisconsin legend, the spelling of “sundae” might be traced back to a salesman selling the familiar canoe-shaped dishes as “Sundae dishes,” perhaps even unaware that he’d misspelled the day of the week. Hard proof is found on the pages of the Ithaca (N.Y.) Daily Herald in 1892 that druggist Chester Platt was serving up a dish called “Strawberry Sunday.” It’s the first documented use of the name “Sunday” being used for a treat served at a soda bar. 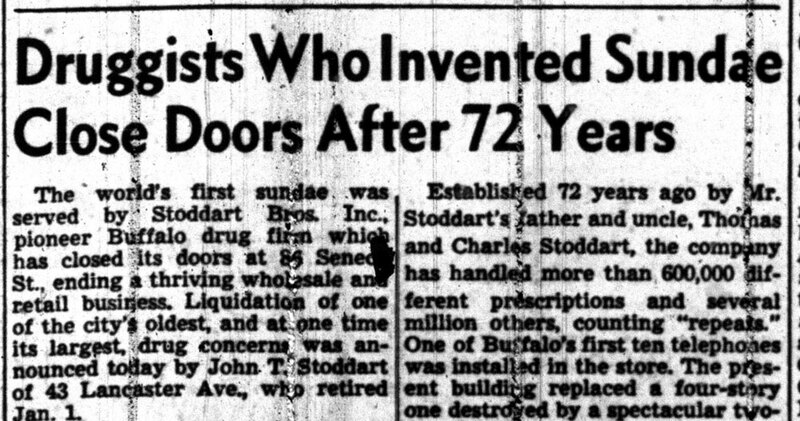 Where does Buffalo’s Stoddart Bros. contribution fit in? Found in the pages of The Buffalo Evening News and the Buffalo Courier are ads for Stoddart’s adding both fruit syrup and whipped cream to ice cream as early as 1889, years before other “fruit sundae” claimants. This concrete black-and-white proof is good enough to at least mention Buffalo as one of the potential homes of the sundae. Stoddart Bros. did have Buffalo’s first soda bar. They did, in the 1880s, serve ice cream with fruit syrup and whipped cream, which sounds a lot like a sundae — even if they didn’t call it that. The secondhand retelling of an old family tale by an 84-year-old man may have had some factual errors, but refitted with the actual facts, it seems very much like Buffalo could be the home of the ice cream sundae. 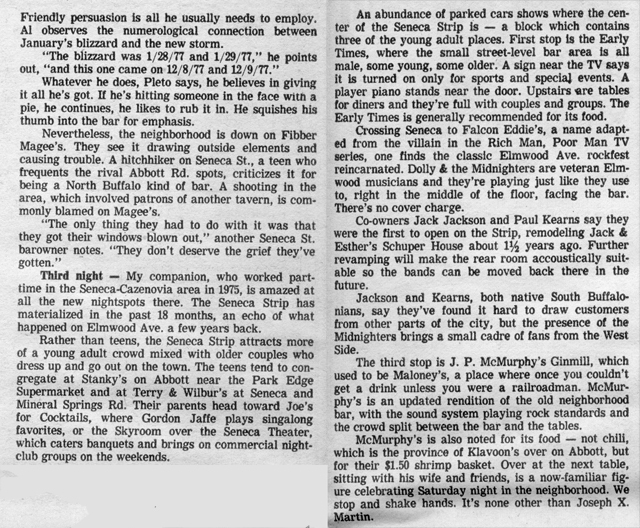 In the year of the big blizzard, the iconic Buffalo News tavern and music critic Dale Anderson counted 17 bars on Seneca Street between Elk Street and the city line. Terry & Wilbur’s — 1944 Seneca St. at Mineral Springs. Across Seneca Street from Rite-Aid in the large building on the corner. JP McMurphy’s — 2126 Seneca St. Formerly Maloney’s — an old railroad man bar. Recently D-Bird’s and Brandy’s Pub. 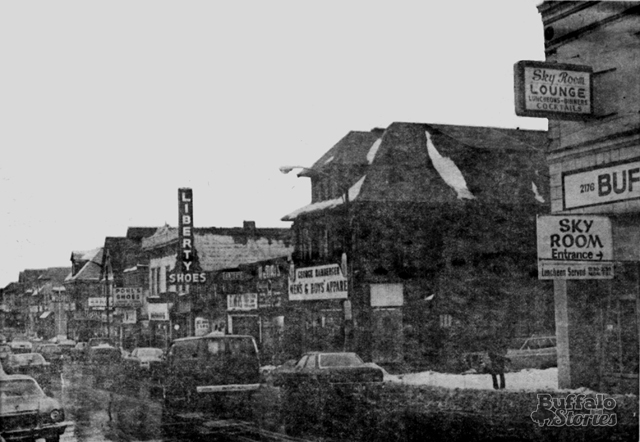 Early Times — 2134 Seneca St. Now the Blackthorn Pub. The Sky Room — on the top floor of the old Shea’s Seneca building. You’d drive into it if you drove straight through the Cazenovia Street intersection. Fibber Magee’s — 2340 Seneca St. Recently Mr. Sports Bar, near Duerstein. Smitty’s — 474 Abbott Road, now Doc Sullivan’s. Smitty’s was famous for the unique tangy wing recipe created by Carol O’Neill at the bar. You can still order Smitty-style wings at Doc’s and many other South Buffalo taverns. 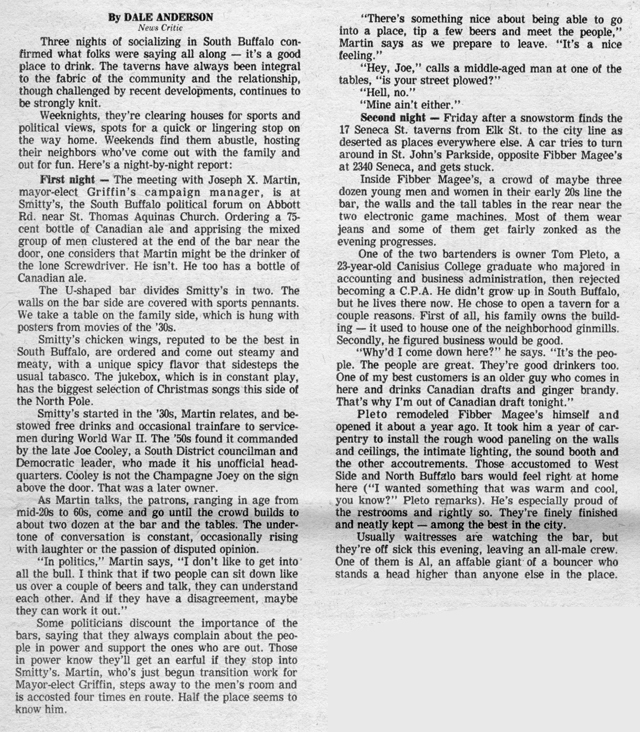 Now armed with a better sense of where these places were, here’s Dale’s original tale of three nights of drinking in South Buffalo 39 years ago. 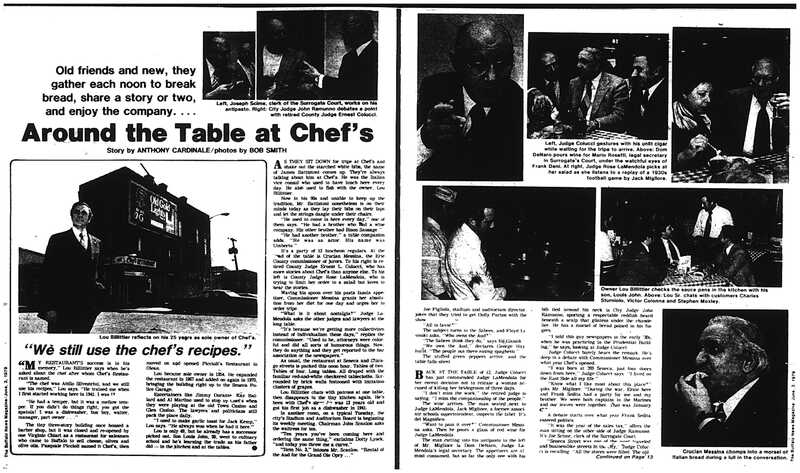 Politicians and paisanos of a past era filled Chef’s on the day in 1979 when News reporter Anthony Cardinale stopped by with a notebook to absorb some of the feeling of a landmark. Thirty-five years later, Chef’s is still going strong. 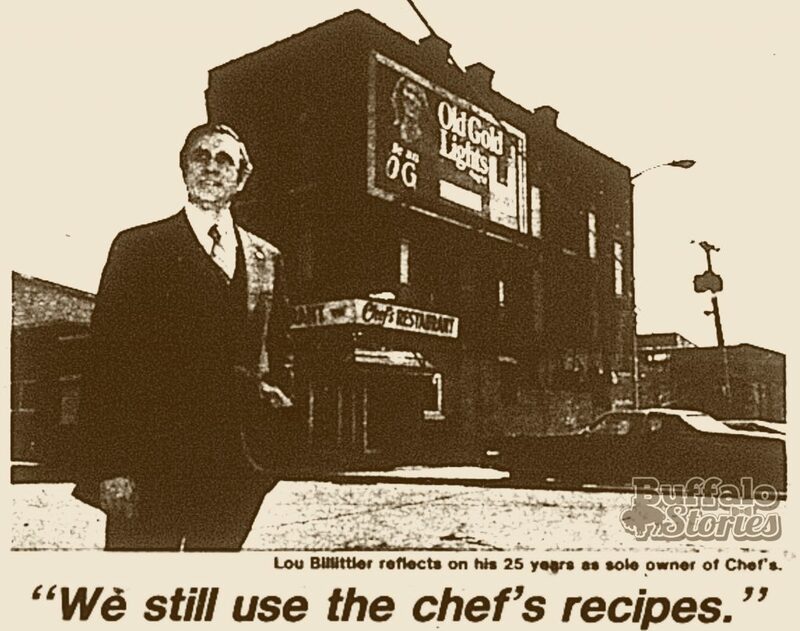 “ ‘My restaurant’s success is in his memory,’ Lou Billittier says when he’s asked about the chef after whom his restaurant is named.